I have tried my hand at flying remote control helicopters a few times. Once the copter flew away never to be seen again. I suspect this was a response to seeing how poorly I landed my RC plane. The second time I crashed it shortly after takeoff. A RC pilot much better than I has taken a video of his DIY copter with a roman candle launcher underneath. The dude put the fireworks on the bottom of the copter, and used a match head on a resistor to light the fuse when he was in range of the enemy balloons (filled with highly-explosive hydrogen) in a snowfield. 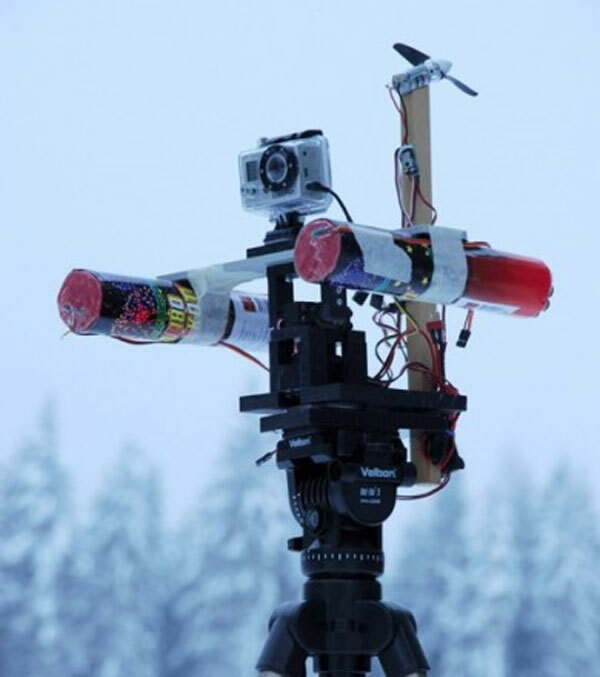 He also rigged up a camera tripod with some roman candle sentry guns for effect. He then piloted the DIY copter into the fray and shot the balloons down. It’s cool even though I know beyond a doubt that if I tried this, I would have crashed into a tree two seconds after takeoff. You can read more about the copter and its construction at RCExplorer.